Evidently, they just don’t get it. Newport Beach police have cleared the truck driver in the death of cyclist Sarah Leaf, concluding that she lost control of her bike and fell under the turning truck on her own, without the truck ever hitting her. Yet they apparently failed to consider the possibility that it was a massive truck passing too close and/or turning across her path that caused her to lose control. So let’s get this straight once and for all. Skilled, experienced cyclists don’t just fall over. And a vehicle doesn’t have to actually hit a rider in order to cause her death. Something made her to lose control. Until the police can offer some reasonable explanation of what that was, we should not accept the results of this investigation. And until police everywhere figure that out, no bike rider will ever be safe on our streets. Update: A commenter who claims to have known a friend of Leaf disputes the contention that she was an experienced rider. By his account, she was a novice rider on a borrowed bike, who had been urged by a friend not to ride that day. And according to him, the reason she fell because she was unfamiliar with clipless pedals. However, as he did not actually witness the collision, that should be taken with a grain of salt; hopefully, we’ll learn more on Monday when the Chief of the Newport Beach Police Department meets with the city’s Citizens Bicycle Safety Committee. Jin Hyuk Byun, the 19-year old driver charged with killing 18-year old North San Diego bike commuter Angel Bojorquez in a late night hit-and-run, has pleaded guilty to a single felony count of hit-and-run causing death. Byun faces up to four years up to four years in prison — or as little as probation. Hopefully, the court deliver a sentence that shows Bojorquez’ life had value. Unlike courts in, say, San Bernardino. Gardena police have finally narrowed down the type of vehicle used in the hit-and-run death of Torrance cyclist Benjamin Torres on October 10th. Be on the lookout for a maroon or purple 1995 to 2001 Ford Explorer or a 1997 to 2001 Mercury Mountaineer with light to moderate damage to the right headlight area. Call Investigator Matthew Hassoldt at 310/217-6189 if you have any information. And on a related note, his step-daughters are asking cyclists to join them in honoring Torres and calling for bike safety on November 10th. 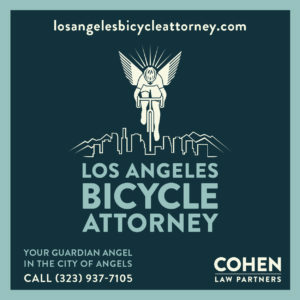 The LACBC is launching a safety education and bike light giveaway program dubbed Operation Firefly. The Times looks at the Bicycle Kitchen’s women’s-only Bicycle Bitchen night. Richard Risemberg writes that bike lanes benefit the entire community, including local merchants. Your access to mountain bike trails could depend on playing nice. South Pasadena may consider extending the Arroyo Seco bike path next week. 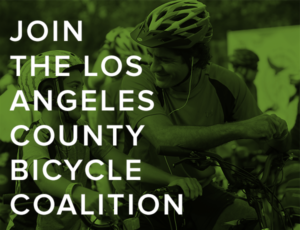 The Culver City Bicycle Coalition is hosting a fundraising ride on Sunday, November 11th, while C.I.C.L.E. is hosting a Made in LA ride on Saturday, November 17. How not to sell a bike on Craigslist. Video of the amazing turnout at last weekend’s memorial ride in Newport Beach. A new female-centric bike shop opens in Orange County. If you’re looking for a good ride and good beer, you could do worse than a ride to North San Diego County’s Stone Brewing Company. Lucky San Diego cyclists get to choose between two bike supporters for mayor, which is exactly what the LACBC’s Civic Engagement Committee is working towards here in L.A. A nurse has her bike stolen when she stops to help an injured cyclist at San Diego Critical Mass — then a local businessman buys her a new one. A coach with the Sacramento Kings hits a bike-riding child while test driving a new Jaguar, then returns it to the dealership instead of staying to help. Palo Alto police arrest two bike thieves after recognizing them from security footage. Who’s the genius who put a Share the Road sign in the middle of a bike lane? A 92-year old Sonoma driver denies running down two boys in a crosswalk, claiming they were the ones who damaged his car — and that one of them was a girl. Seven reasons why bikes are for everyone. What does it take to build a world-class bicycling network, and will the US ever embrace bicycling like Denmark has? Why you might need more than one bike. Someday soon, you may never get another flat. Private bike share program Spinlister changes its name to Liquid, in an apparent attempt to conceal what the hell it is from anyone who might be interested. HuffPo looks at the hubris of Lance Armstrong, while the company that gave him $12 million in bonuses wants it’s money back, and an English town prepares to burn him in effigy; thanks to George Wolfberg for the latter link. Drunk Spokane driver gets two-and-a-half years for killing a cyclist. My hometown employs a smartphone app to crowd source cycling data. Oklahoma City gets its first sharrows. A Texas cyclist is under arrest for threatening two pedestrians with a gun. Doorings are down in Chicago, the question is why. Kill a Windy City cyclist in a right hook, and get a ticket for an improper right turn; no, really. The real riders on the storm — New York filmmaker Casey Neistat captures a four-hour ride through hurricane drenched streets. In the wake of Hurricane Sandy, bikes provide the best way in, out or around Manhattan, as the city bans vehicles with less than three occupants from Manhattan. The anti-bike New York Post blames bike lanes for bus-bike collisions; yeah, it couldn’t be impatient bus drivers, overly aggressive riders or just plain carelessness. The world’s first car-only roadway is now a bike path, even though motorists used to fear the same vehicle segregation that many now call for. A Pennsylvania man gets six months probation for killing a cyclist while driving under the influence — six-effing-months probation, which is exactly the same sentence he would have gotten for a first-time DUI even if he didn’t hit anyone; nice to know the death of a human being doesn’t matter one damn bit in Western PA. The popularity of tweed rides has helped increase the sales of more than just bikes. Helmet-cam video results in charges against a Canadian driver who dangerously Jerry Browned a cyclist — even though he could have safely passed a few seconds later. What to do after a crash. The victim is dead, but at least his bike has been returned. Teenage Brit triathlete is seriously injured in an apparent hit-and-run as she’s found on the side of the road after a car passes her, still clipped into her pedals. A new UK website tracks the best deals on bike gear. An Aussie writer asks whether you consider yourself a cyclist; ever notice that no one ever asks if people consider themselves drivers, which everyone becomes the moment they slide behind the wheel? Finally, South Park takes on l’affaire Lance. A Polish cyclist is charged with speeding in a 30 mph zone — while riding completely naked except for the pants wrapped around his head. And if you think some drivers are blind, you may be right. Sometimes, it seems like you can’t ride anywhere. According to the Orange County Register, four OC senior citizens were stopped by a police officer for riding on the sidewalk — just moments after the same officer warned them not to ride in the street. As they rode along a restaurant-filled section of PCH, the four riders passed a motorcycle cop as he finished writing a ticket, and made a comment about the busy street. The officer responded by saying he wouldn’t ride there, so they took to the sidewalk — legally, as shown by a sign indicating that the sidewalk was a designated bike route. So imagine their surprise when the same officer roared up a few blocks later, lights and siren blaring, and — incorrectly — told them that riding on the sidewalk is against the law in California. He specifically pointed to CA Code 12.56.30 (A) NBMC, which doesn’t seem to exist in the Vehicle Code. In fact, the only California Code I could find by that number is one that assigns responsibility for the unauthorized release of hazardous materials. Maybe he just scared the crap out of them. Oddly, only two of the cyclists were cited by the officer, while the other two — who apparently committed the same infraction — were let go. As it turns out, the cyclists were technically in violation of the law because riding on the sidewalk is allowed next to PCH before Riverside Ave, but banned immediately after crossing the street — even though there’s no sign indicating that the bike route ends or that riders must leave the sidewalk. Amazingly, Lt. Bill Harford of the Newport Beach Police Department defends the officer. It seems far more likely that the department owes them an apology, and should do everything in their power to get the tickets dismissed. They should also work with the city to get proper signage installed instructing riders to leave the sidewalk once the bike route ends. And a little common sense wouldn’t hurt. Because the police can observe the letter of the law. And still be very, very wrong. Update: I may have been overly harsh in my criticism of the officer who wrote the ticket. TC points out in the comments below that the code he cited is part of the Newport Beach municipal code, rather than state law. We don’t have the actual ticket for reference, so there’s no way to know if the officer actually said it was a violation of state law, or if the riders misunderstood him or inferred he was referring to state law. As a result, I’ve toned down some of my comments, and apologize for my earlier criticism that the officer involved was ignorant of the law. However, I still believe that a warning would have been appropriate under the circumstances. Most cyclists aren’t familiar enough with local ordinances to know where they can and can’t ride on the sidewalk, and it’s virtually impossible for cyclists to know when they’ve moved from one area where it’s allowed to another where it’s banned without adequate signage, particularly after having just passed a sign saying it was legal. Meanwhile, LADOT Bike Blog continues its excellent examination of local sidewalk riding ordinances; maybe they’ll go south of the Orange Curtain and take a look at those wacky folks in Newport Beach. And Gary points out that if Santa Monica wants to ban bikes from the sidewalk, they should defend cyclists who ride in the street. The Mayor’s office has created a Facebook page for his upcoming Bike Summit on Monday; if you’re not one of the 5,696 people invited so far, invite yourself — or just show up. 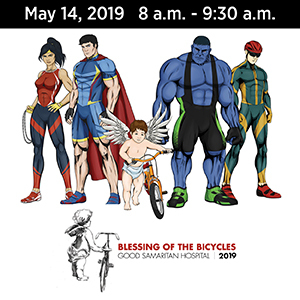 The next Bikeside Speaks takes place Saturday, August 21st in conjunction with Santa Monica’s Cynergy Cycles, Specialized and the Disposable Film Festival; the above mentioned Gary of Gary Rides Bikes will be one of the speakers. Beverly Hills Patch looks at local cycling instructor and bike activist Ron Durgin. The Times’ Chris Erskine names Lance Armstrong to his all-ego team. Claremont Cyclist says even if L.A. builds the 40 miles of bikeways each year that they’ve promised, they still have a very long way to go. Cyclelicious looks at how to get local traffic engineers to enforce the state law requiring traffic signal actuators to recognize bikes. Los Altos cyclists and drivers compete for space on the roads; according to the writer, bikes are entitled to the full lane but should keep to the right of it. Huh? Chicago calls its bike share trial a success and plans an annual return each spring; DC’s starts next month. A leaner, meaner — and cheaper — approach to bike share. 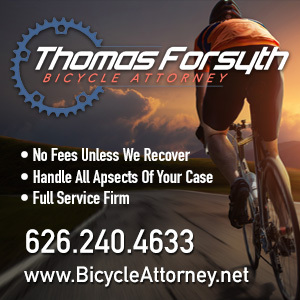 A Wisconsin driver faces a $114 fine for violating the state’s three foot passing law by running over and killing a cyclist; thanks to Witch on a Bicycle for the heads-up. Consider a Tour du Fromage through the Wisconsin’s cheese country. A Boston cyclist is killed; police say it’s just an accident. A mean old rich guy wants Boston area cyclists to stay the hell away from his yard. Keep pandas away from your bamboo bike. A cop tells a Tennessee cyclist to get off the road. Even a helmet advocate like me agrees that avoiding crashes is the most important factor in avoiding serious injury; meanwhile, mandatory child helmet laws apparently reduce injury rates by keeping kids off their bikes. Vancouver business owners are up in arms over a proposed bike lane. A former world junior champion struggles to come back from a near fatal collision. The president of the World Anti-Doping Agency wants to ban your morning eight cups of espresso. A Brit bike messenger claims to have delivered a document 125 miles in five and a half hours. Town Mouse has her head turned observing a rare Pederson bike. A British law firm wants to increase the understanding between cyclists and truck drivers; how’s this for an understanding — just don’t kill us, okay? Finally, Pinarello has replaced the Porsche as official status symbol of the mid-life crisis.